ab65949 recognizes a conformationally-dependent epitope of CD8. The antibody does not react with formaldehyde-fixed cells and is negative in Western Blotting. Tissue/ cell preparation (Human):Crude thymus membrane fraction. Our Abpromise guarantee covers the use of ab65949 in the following tested applications. Flow Cyt: Use Neat: 10µl for 106 cells, or 100µl whole blood. Is unsuitable for applications using formaldehyde fixed cells. 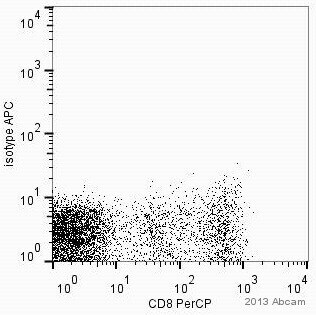 ab65949 staining CD86 in Human whole blood by Flow Cytometry. The sample was incubated with the primary antibody (1/50 in 2% Human serum + 0.5mM EDTA in PBS) for 25 minutes at 4°C. Publishing research using ab65949? Please let us know so that we can cite the reference in this datasheet.